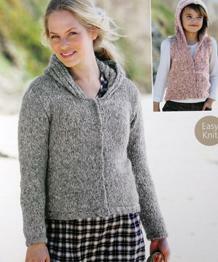 Easy and cosy V neck sweater or slipover, knits up in no time in Sirdar Snuggly Snowflake Chunky yarn. 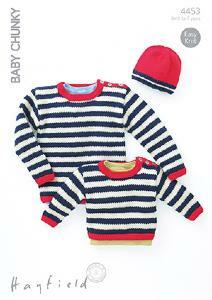 To fit 0-7yrs, 41-66cm (16-26in). 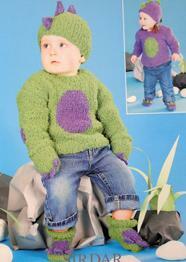 Sweater with contrast yoke and shoulder buttons plus bobble hat in Sirdar Snowflake Chunky. 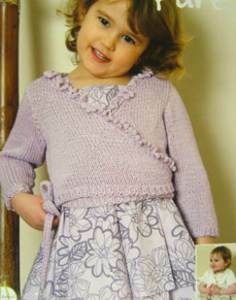 To fit 0 to 7yrs, 41-66cm (16-26in). 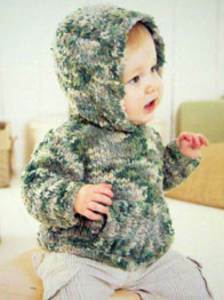 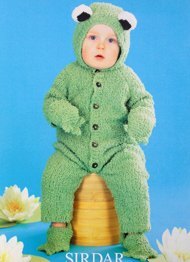 Cuddly bear suit in Sirdar Snowflake Chunky, fits 0 -2yrs 41-51cm (16-20in). 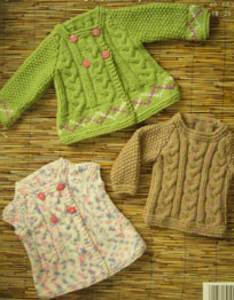 14st/ 19 rows to 10cm, 5.5mm needles. 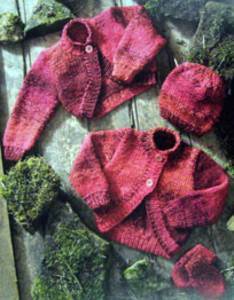 Curved edge bolero in 2 lengths plus matching hat and mittens, shown in James Brett Marble Chunky. 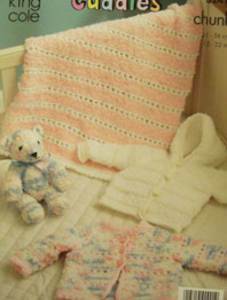 To fit 31-56cm, 12- 22in. 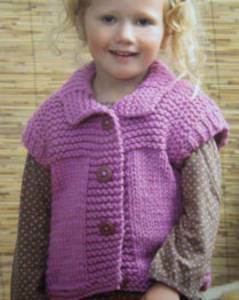 Slipover, waistcoat with shale st edging, socks with lacy or ribbed cuff and leg warmers, shown in King Cole Zig Zag self patterning 4 ply. 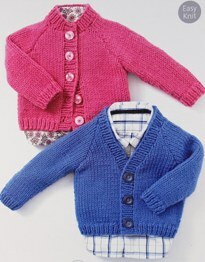 To fit sizes 61-76cm (24-30in). 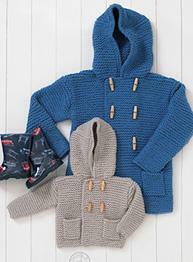 Double fronted jacket with cables and swiss darning detail shown in King Cole Comfort Chunky, plus sleeveless gilet and sweater. 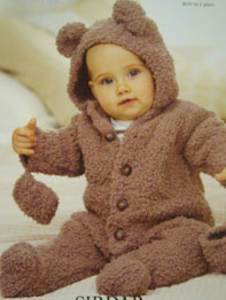 To fit 6mths to 5yrs, 46-66cm (18-26in). 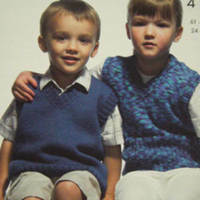 Gilet with optional contrast trim, plus sweater with tab collar and pocket, shown in King Cole Comfort Chunky. 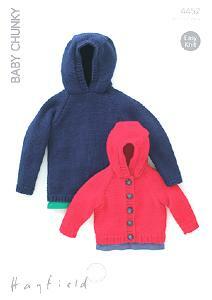 To fit 6mths to 5yrs, 46-66cm (18-26in). 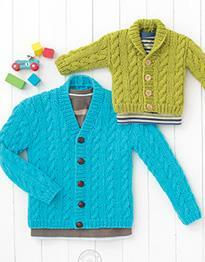 Striped sweater shown in King Cole Comfort Chunky with rolled or ribbed edgings, plus cardigan with shaped front. 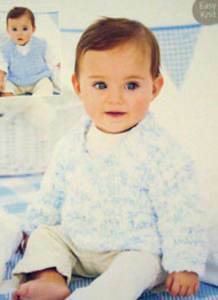 To fit 6mths to 5yrs, 46-66cm (18-26in). 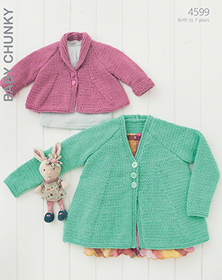 Wrap cardigan with long or short sleeves in Wendy Pure bamboo tape (now discontinued, knits to approc aran weight). 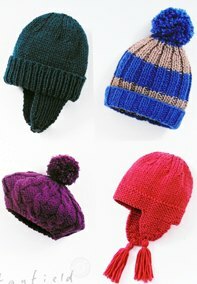 To fit 41-56cm (16-22in). 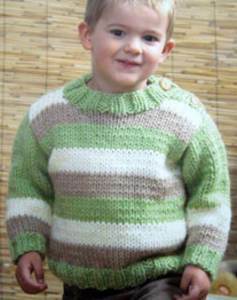 20st/26 rows to 10cm, 5.5mm needles. 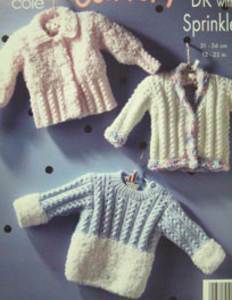 Sirdar 9887. 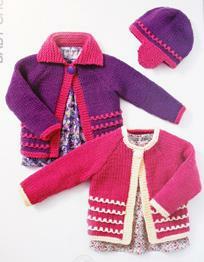 Woman and girls jacket and gilet to fit sizes 24-46 in, 61-117 cm and shown in Sirdar Freya.